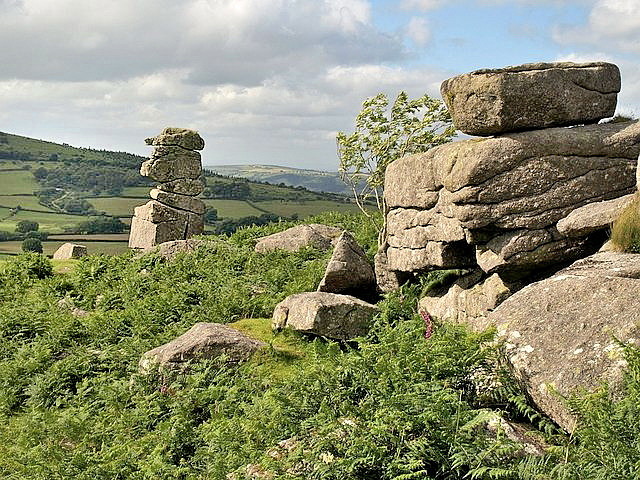 Within Dartmoor National Park, Hayne Down contains a number of wierd and unusual rock formations many of which have local names. This is said to be the most famous and is a tower of rocks which looks nothing like a nose. Bowerman's Nose is a stack of weathered granite. It is situated on the northern slopes of Hayne Down, about a mile from Hound Tor and close to the village of Manaton. It is about 21.5 feet high and is the hard granite core of a former tor, standing above a 'clitter' of the blocks that have eroded and fallen from it. With a little imagination, it is possible to see the profile of a face. As well as the rock there are some stunning views to be had of the moors from here. Getting there: From Exeter you can approach North via the A30 or south off the A38. Off the A382 north of Moretonhampstead.